Made like a sherman tank, brilliant depth, tons of accessories, and still a wide choice of coils as all sovereigns can share coils, amazing on wet/black sand great on pasture a true legend. The older Xs machines are better constructed than there modern counterparts, and they perform as well if not better, if by some miracle you can source the original Coinsearch coil which are much lighter than latter coils, you then have a brilliant combination. Because these machines are getting on a bit the original battery pack may be not take a full charge. You can obtain a battery pack and charger which is superior to the original, these machines are good beach and inland machines simple to use, now have almost a cult following, you wont be disappointed! I got the Metal Detecting itch again after being away from it for about 15 years. I was in a pawnshop and met a nice gentleman who had a Garret GTI 2500 that he was making a loan on. After chit chatting with him he offered to sell me his for $1000. Me being a ex pawnbroker of 22 years got on my laptop and started investigating and found they were just over $950 on ebay. Checking Craigslist I found one north of Dallas for $500. And I bought it. Well I had to get my girlfriend one so I found a Garret 250 ace at a pawnshop locally for $250 and I liked it better than the GTI 2500. It reminded me of my old Tesoro Silver Sabre. It was just a little better with all the different modes at your finger tips and a little more on depth. I still wasn't quite satisfied. With all the information at with the World Wide Web I began my search for me a real pacifier. I new from all he forums that I read that Minelab Sovereign with a meter was in the stars. On Ebay I chose a Minelab Sovreign XS 2aPro. I picked it up December 29,2011 from the post office. I had read the instructions online and watched the beginners video on youtube. On the way home from the Post Office I spotted a 1930's style home with someone in the back yard so I stopped and ask permission to detect their front yard and they said yes. I set the detector at the beginners setup positions that are pre-marked for you. I found quite a few coins but nothing real old, a Texas shaped rabies tag from who knows when and a few pull tabs. Used it the next day at a school and found my first silver dime since I retuned. I used it everyday and today I graduated. I don't need any discrimination anymore. I have paid attention. When this unit hits something it wants me to dig it screams a higher pitch scream than aluminum. When this unit says 520 to 525 there is something copper clad or silver down there. You better dig till its not there anymore. It can have a tab right next to it saying 479 1/4 inch in another direction but you dig and get the silver. It may be 12 inches or more down but its there. And if it quits giving you a signal and you haven't found it on top you dig some more because you turned it on edge and its still there. It has not lied to me yet. Take your time in trashy areas. As I said before you can move it ever so slightly and get a different target. Mount the brain on your hip. I took a nylon tool pouch and took a wood burner and made a whole in the bottom for the coax to run into for the brain. I can swing it for 3 hours without a break. 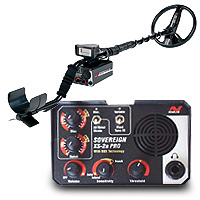 Have used many detectors modern and old, the best out the lot is the minelab sovereign. Wouldn't trade it for anything. I have been a Tesoro man for years but purchased a new Minelab musketeer advantage pro low frequency machine that has produced great results for me, this got me wondering about Minelabs bbs multi frequency system so I purchased a mint sovereign xs2a pro with the digital ID meter. On my fist trip out with this machine I thought what the hell is going on with all the nulling noises and holes that were so deep that I thought the machine was playing games with me, but it was not. This machine is easy to use after a couple of trips out, with the best depth I have ever come across in the past, it is true that a multi frequency bbs machine sees alot more stuff in the ground and the finds just keep on coming, I recently went over a field that I have done to death with other Tesoros machines and counted the signals and holes I dug, I was amazed that the sovereign found 17 copper coins, six buckles, 1 Roman coin and two watch key winders, these were the finds that was instantly identified with a further 121 other pieces of metal that were not easy to ID and also no iron was dug at all with the discrim set at nil. There is no doubt about it that Minelab bbs system works and works very well indeed and as far as I am aware is the only company with this system in place. Also the sovereign ranges are heavy, but I have set mine up on a straight shaft and hip mounted the box in the Minelab accessory pouch, also I purchased two more v clips and fixed them to a short piece of cut stem so that the meter is clipped on the control box, all you swing around is the coil and stem and this can be done all day long. My over all verdict on this machine is that it is deep, sensitive, well built and does not lie and most of all finds loads of finds in iron infested ground, this is a machine you will not want to get rid of well done again Minelab. There is no doubt about it that Minelab know how to build good quality machines with bbs and fbs multi frequency this is where Minelab leave the rest behind, why search in one frequency when you can search with many all at once. I have been using my Sovereign For around 10 years for saltwater beach detecting; It has never failed in any way. In all the years that this detector has been on the market there is still nothing that can outperform it in stability, depth of penetration and accuracy of discrimination on saltwater beaches, some may match it but none can beat it. If anybody out there knows of a detector that is better in all aspects than the Sovereign as a beach machine, please tell me what it is? The Minelab Sovereign is an outstanding metal detector.This unit is hard to use at first, but once a user understands how to use the Sovereign they'll be hooked.I use a straight shaft for balance,a 180 meter,and a Sunray probe on mine.With these add ons its probably one of the most pleasant units to use.If you're a serious park hunter the Sovereign is the only way to go.My suggestion start out with the 800 coil to learn this detector,and then move up to the 10 inch coil. good detector, founds heap of coins with one......grab one today if you see one!!!! Amazing detector, it have the best discrimination quality of the market, with rescaled meter and the white 11" Coinsearch coil is unbeatable. The Sovereign XS2a Pro is just one of the Sovereign series of detectors that has been made since 1991. The first was the Original Sovereign, then the Sovereign XS, the XS2, the XS2a and now it is called the Elite. They all are basicly the same as far as performance, the XS2 was the first to have the waterproof coil and drop in battery pack, the XS2a Pro come with a toggle switch to go from the muliti tones of the Sovereign to a signal tone which I felt was a useless feature as the whole strenght of the Sovereign is it multi tones. The Sovereigns have been a excellent detector for those that take the time to use this detector and understand it, the depth has been some of the best I have seen and the ID is better than anything out there, but you have to know what the Sovereign is telling you. For the first few times out with it and all the tones and nulling I wondered what I got myself into, but after I seen this detector was telling me more info that I was used to hearing and seeing I realized I just have to short out the info, plus it was seeing more than any detector had before. With the digital ID meter and the tones I found that the Sovereign was telling me what it seen and let me decide weither or not I wanted to dig or not, not like some detector that just beep if it think you should dig or not. If you have a little patince and want to find the deep coins and the ones close to trash other have missed the Sovereign is the one for you. I use the rescaled Minelab digital meter that read 180 number so all my copper and silver and clad coins will read 179-180 while a new zinc penny or even a IH penny will be 176-177 and ny nickle which the Sovereign is hot on is 144-145 plus a diffent tone for each item, so you only have to look at the meter for the close tones. Been detecting since 1973 and I find the Sovereign one of if not the best there is.